Let k be the number of elements common to all three sets, u be the number of elements in both A and B but not C, and v the number of elements that are only in B. 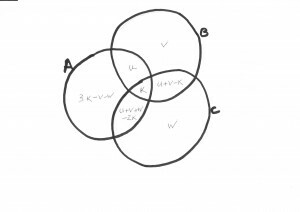 Since u+v is the number of elements in B but not C, the same number must be in both B and C. k are in all three so there must be u+v-k in B and C but not A. Now let w be the number of elements in C only. Then the total in C but not A is (u+v-k)+w=u+v+w-k, and since there are k in the common set, the number in A and C but not B must be u+v+w-2k. 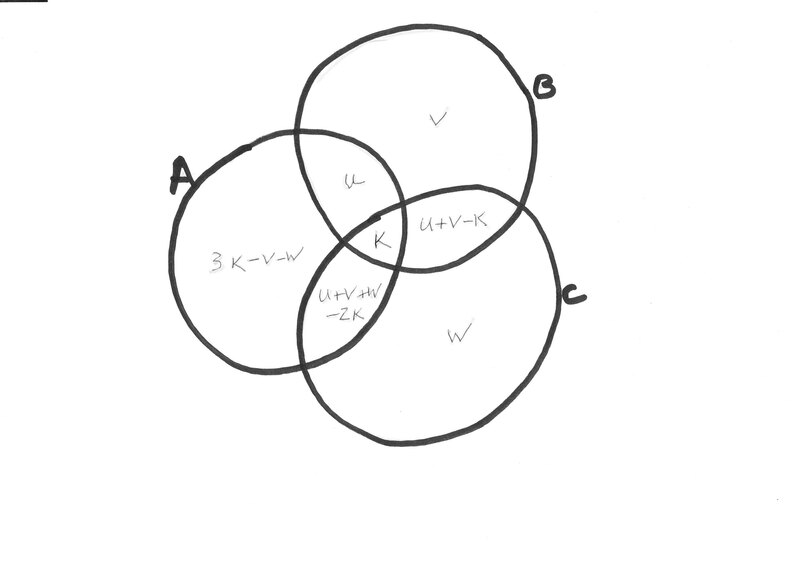 Since the total number in A must be twice what’s shared with B, that is 2(u+k), the number that are only in A must be (u+k)-(u+v+w-2k)=3k-v-w.
for positive integer values of k,u,v,w with u+v-k≥0 , u+v+w-2k≥0, and 3k-v-w≥0. Equivalently, we could take k=1, look for rational values of u,v,w and rescale at the end to get integer solutions. For fixed v and w, R->1 as u->infinity and is monotone in the domain so there are no interior critical points. We can therefore restrict our attention to the boundary.